No matter the language or country, kindness means the same thing. 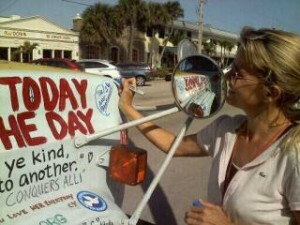 Native Spaniard, Beatriz, is living in the United States and loves The Kindness Bus. She thinks that one of the greatest movements that could spread across Spain is a message of kindness. I agree wholeheartedly. Beatriz has taken it upon herself to be a One Million Acts Of Kindness ambassador by spreading the news of my mission to her friends and family. The words she wrote on the bus, “Paz y amor parasiempre,” sum up what is needed everywhere. Thank you Beatriz for helping to spread this most important message across the pond. The Kindness Bicycle / Kindness Bus Tour begins in forty-five days, please take time to peruse the information located above this blog. This entry was posted on Wednesday, March 30th, 2011 at 6:15 am	and is filed under Kindness. You can follow any responses to this entry through the RSS 2.0 feed. You can leave a response, or trackback from your own site.